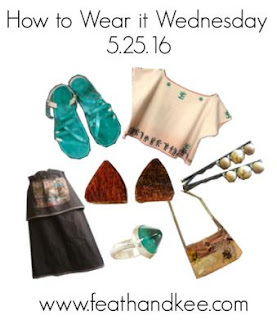 This week's outfit is a celebration of the warm, sun-soaked days of late Spring. Everything is handmade and available on Etsy. 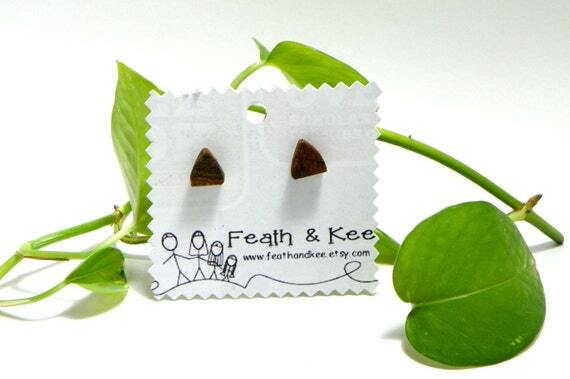 These triangle earrings from our shop were made from a dried out tree root. The rich browns are the natural color of the wood. They have stainless steel posts. 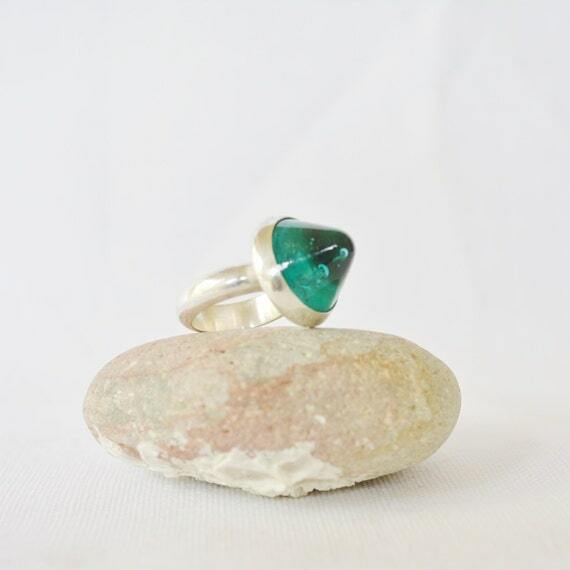 This ring from Shelby Fonley is made from sterling silver, and lampworked glass. It is available in a size 7, but you can request a custom ring to be made just for you. 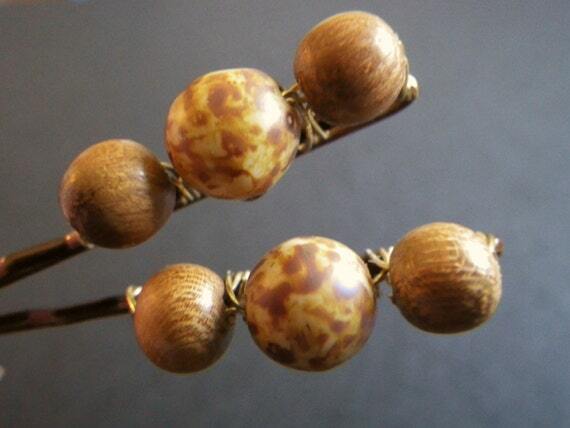 Picture Jasper and wood beads are woven together with gold wire to create these pretty, rustic hair pins from CassieVision. 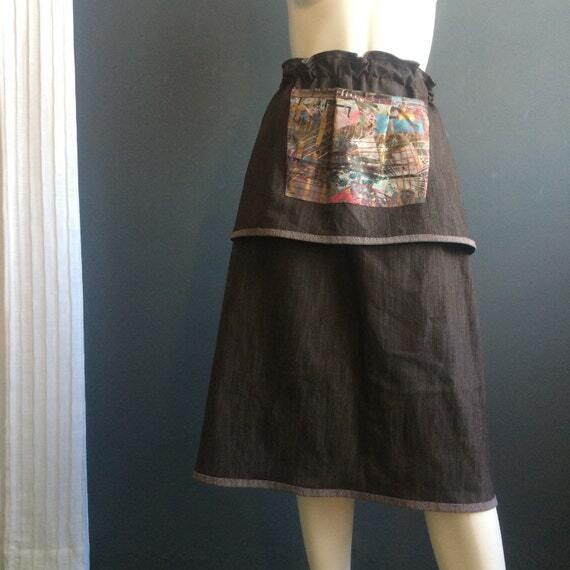 This lovely, one of a kind skirt from iheartfink was made from a dark grey stretch denim. It features a pocket made from the artist's printing cloth that was used in the creation on many prints over the years, creating a work of art that can not be duplicated. 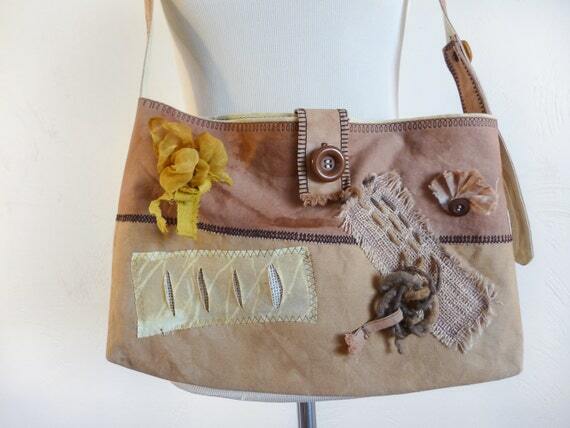 This one of a kind bag from DesertValleyCrafts was made from hand dyed fabrics, using plant based dyes. 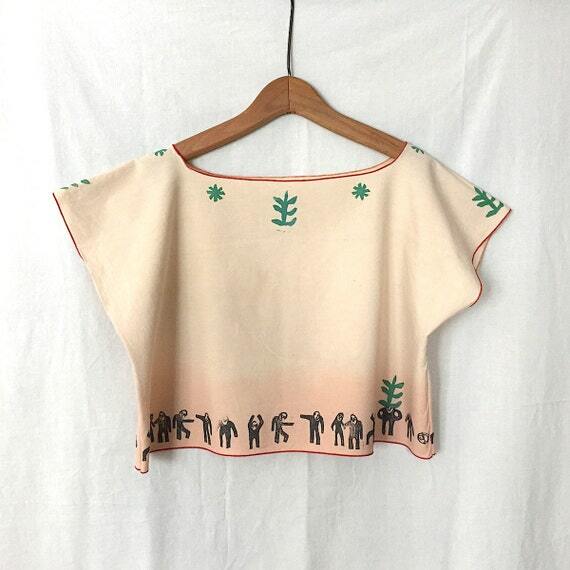 I am not really sure if it is possible to get more eco-friendly than this crop top from brilliantstranger. It was made from recycled cotton. Hand dyed with plant based dyes, and hand printed. 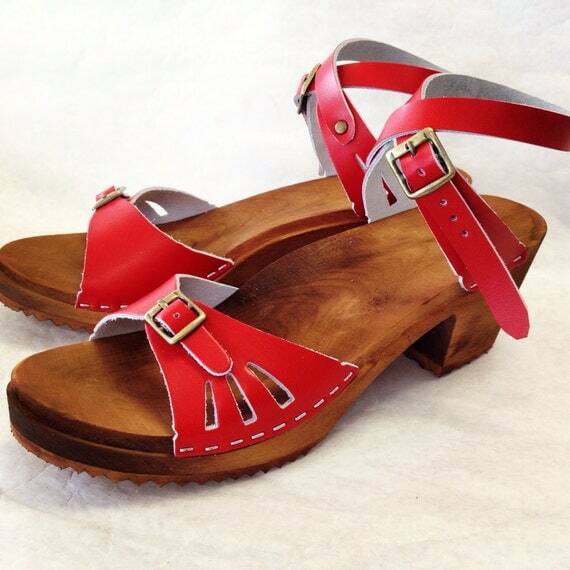 From the Wander Collection by Heidi Louise, the Maximus has a diagonal strap that goes across the foot. 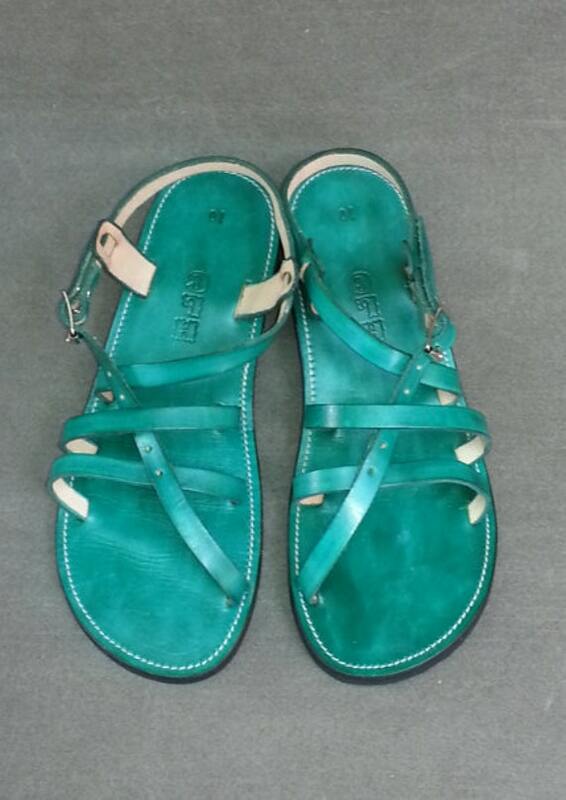 Each pair is custom made to fit your feet. 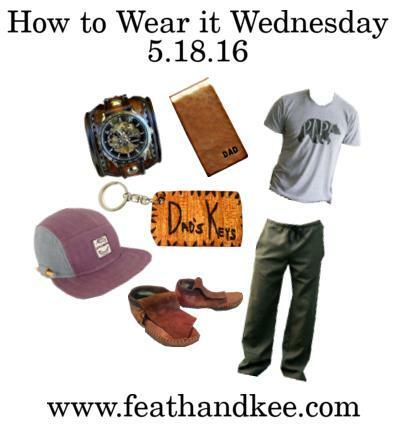 For this week, I put together an outfit full of gift ideas for Father's Day. Everything is handmade and was found on Etsy. 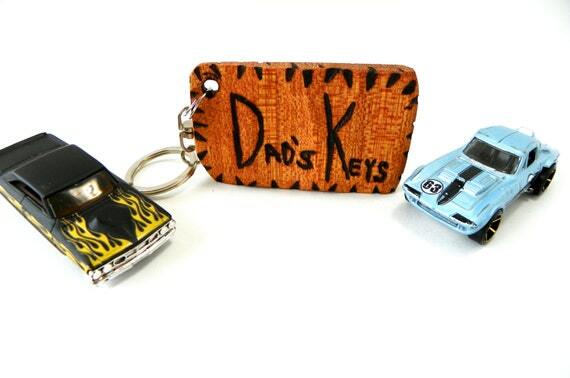 With this key chain from our shop, Dad won't have to figure out which keys are his. It was made from reclaimed wood and finished with linseed oil. 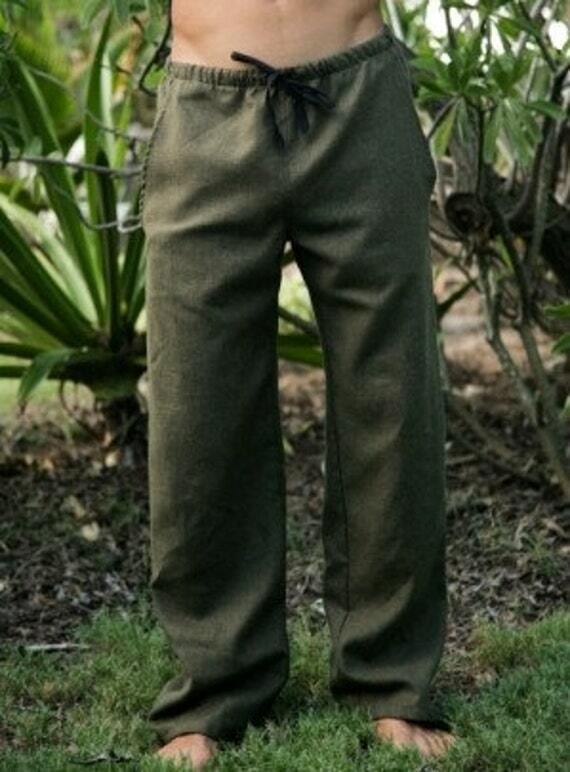 Versatile and comfortable, these pants from a.ell atelier are made from a hemp and tencel blend, making them as easy to care for as they are to wear. This shirt from The Oyster's Pearl was screen printed by hand. 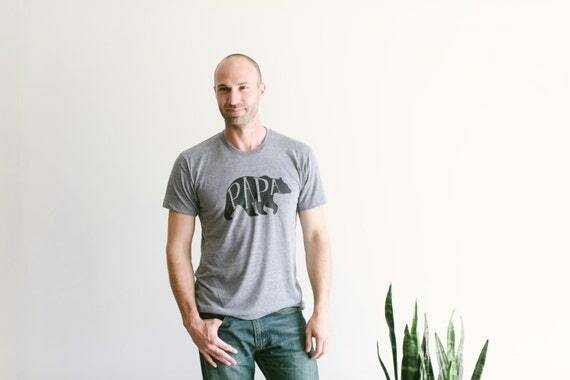 They also have Mama, baby, little, sister and brother bear shirts available. 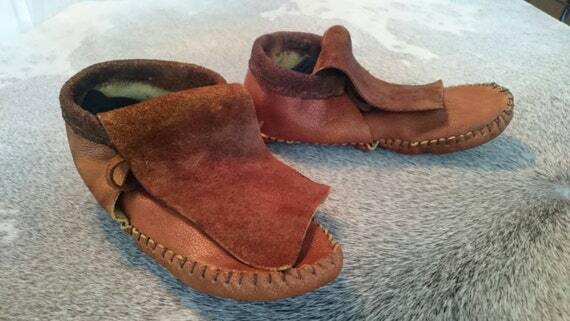 Made to order from bison hide, these Inca style moccasins from Khaos Theory Leather can be worn as they are, or you can request that a rubber crepe sole be added. 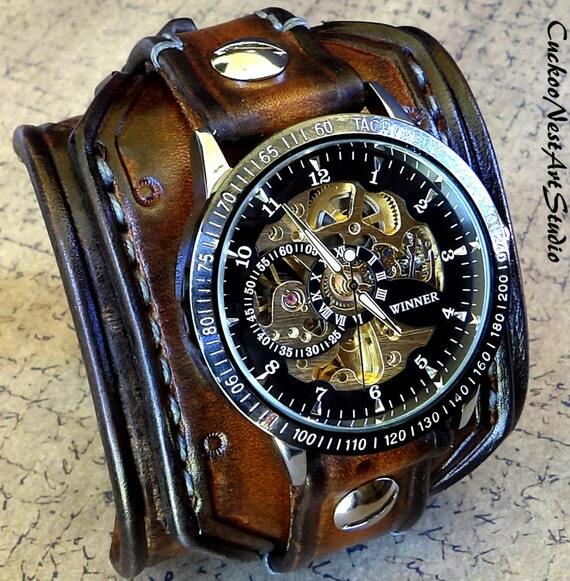 This made to order wrist watch from Cuckoo Nest Art Studio is hand stitched and tooled from vegetable tanned leather. 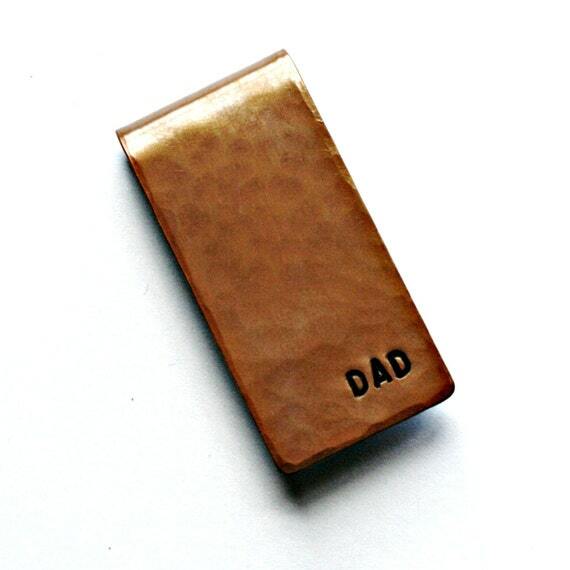 This copper money clip from Hardware Designs was cut and hammered from an 18 gauge copper sheet. It is made to order, so you can choose from several different fonts. They will also add an initial, name or phrase for no extra charge. 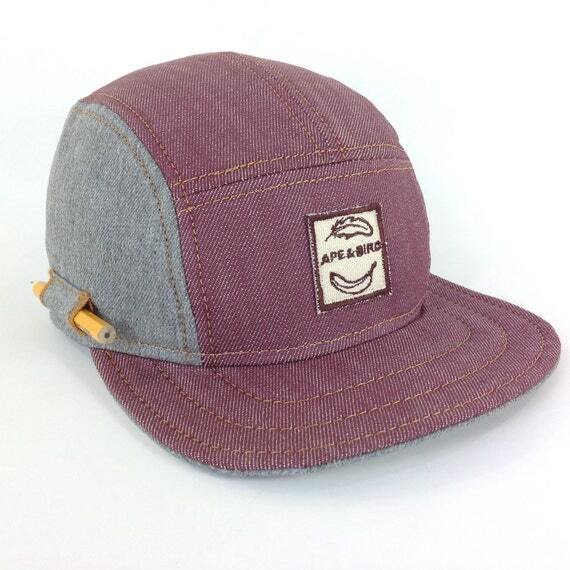 I love the pencil holder on this hat from Ape & Bird. It was made from Cone Denim, which happens to be one of the very few textile mills left in the United States. Each hat also has it's very own serial handwritten on the inside. Hello Wednesday! This week I am keeping things local. 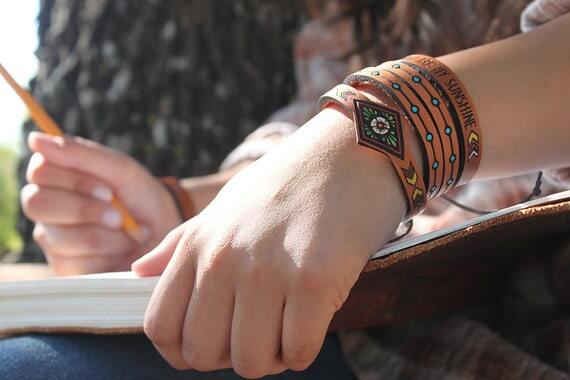 Everything is handmade and from a 103 mile radius of Olney, Texas. I do not have the words to adequately express how awesome it was to find so many neat things being made close to where we live. You have to take in consideration that we are in a very rural area. One hundred miles could mean nothing but pastures around here. 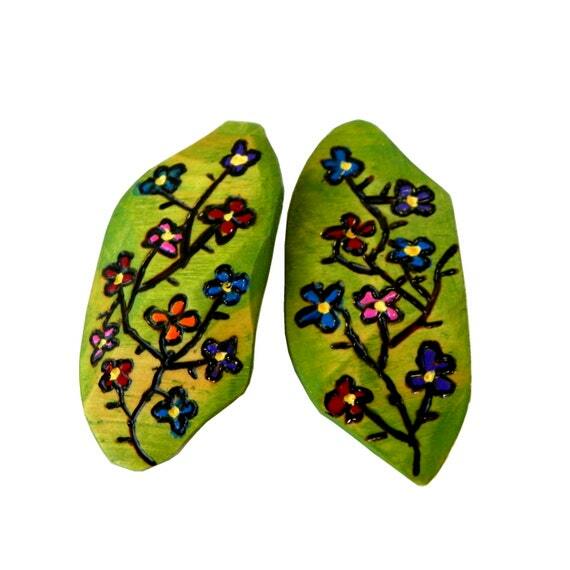 Brand new to the shop, these hand-painted earrings feature a burned in floral design, and were made from reclaimed birch. They have stainless steel posts. 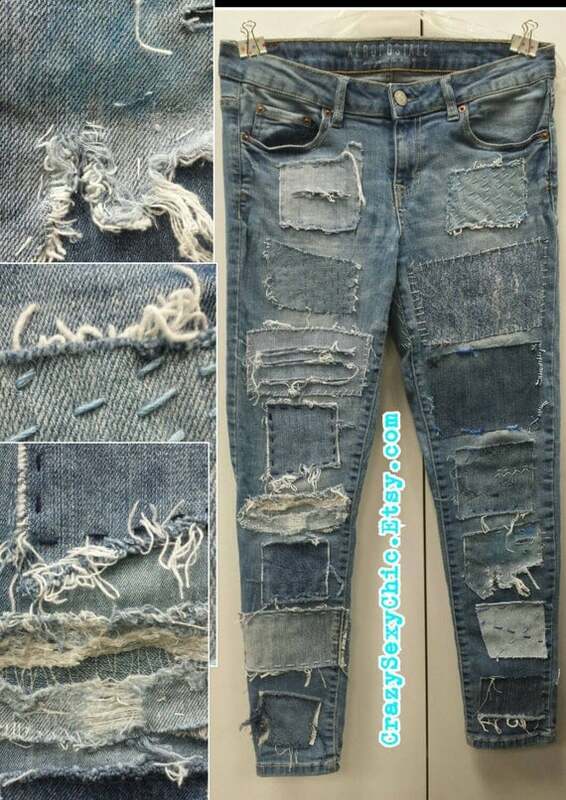 Created 45 miles away, in Wichita Falls, this pair of upcycled jeans have been distressed and patched for a one of a kind look. You can find them at CrazySexyChic. 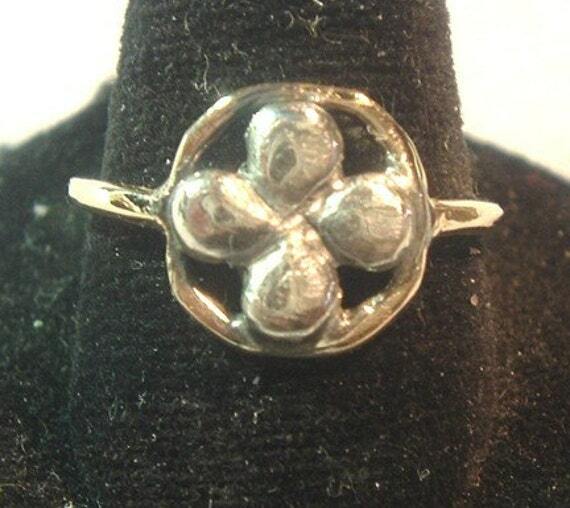 Created 100 miles away in Fort Worth, this two-tone ring from PatriciaRileyJewelry is made from 14 karat gold with a sterling sliver clover in the center. 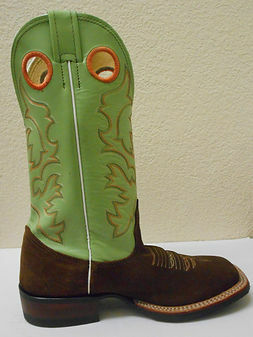 Located 91 miles away in Nocona, the Fenoglio Boot Company manufactures the James Montague boot line. The pair of boots that I am featuring in today's post, is the JM103. 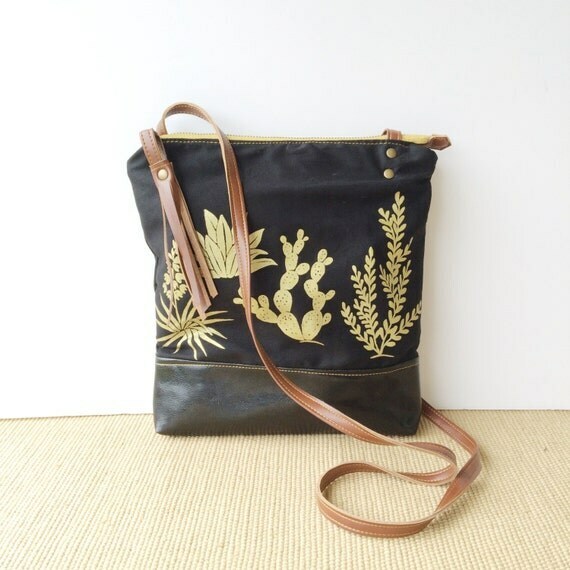 Sewn from hand-printed fabric 103 miles away in Denton, you can find this cute made to order bag at RACHELelise. 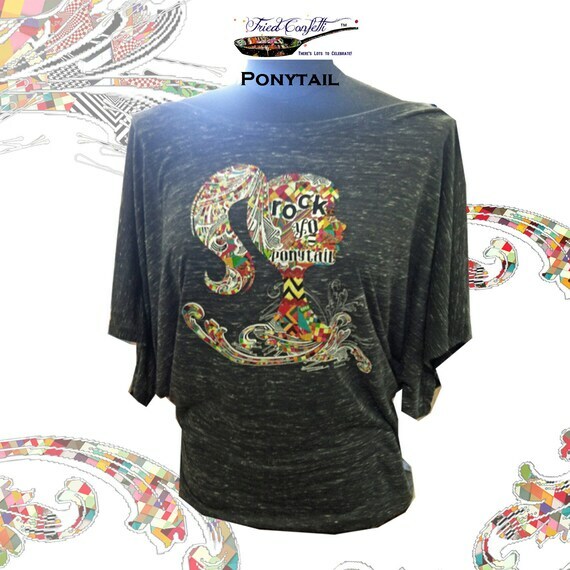 Another Fort Worth find, this neat shirt from Fried Confetti features original artwork printed on a heather blend tee. 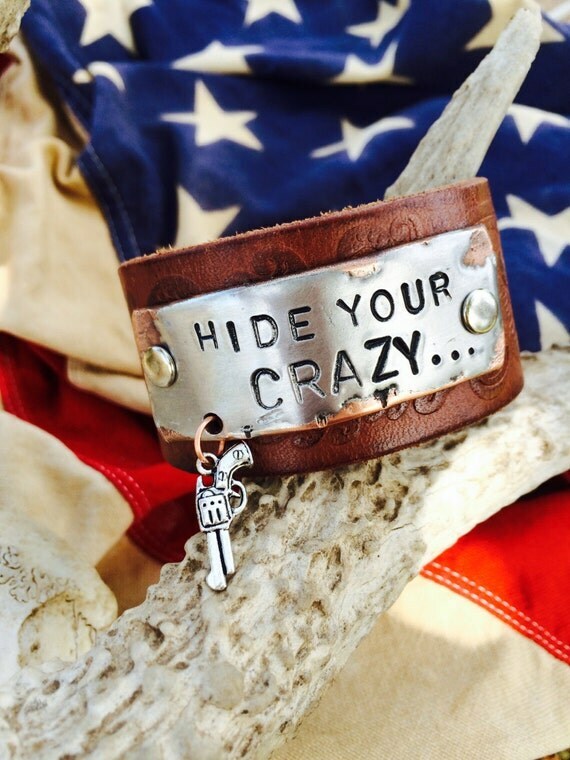 Located the closest to us in Throckmorton, the talented ladies from Joli Jonque made this cuff from vintage reclaimed leather, and hand-stamped silver soldered copper. That's it for this week! I hope that you enjoyed my "shopping trip" as much as I did! I challenge you to search, Google, or just physically get out there and see what is being made by people in your neck of the woods. 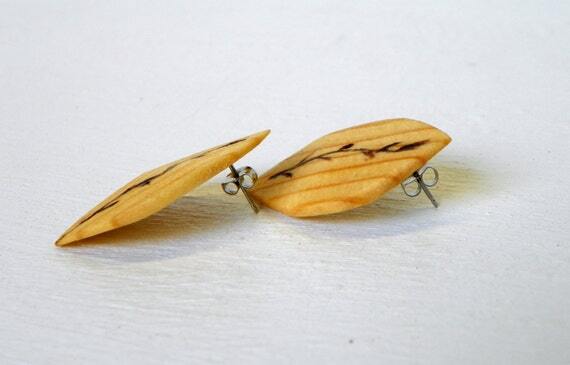 Made from reclaimed wood, and finished with linseed oil, this pair of earrings from our shop were inspired by delicate leaves. They are lightweight and have stainless steel posts. I love the versatility of this cute bag from Whitney Jude Handbags. 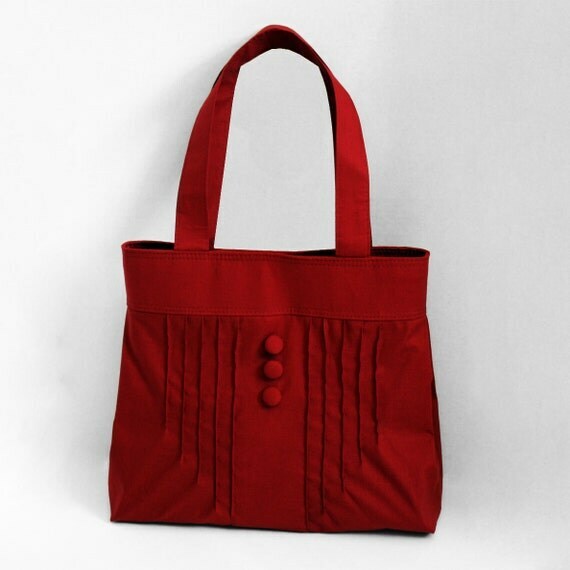 It is made from cotton, and if you need it in a different color, you can request a custom bag made just for you. I am not sure if it would be possible to be in a bad mood wearing this necklace from Anna Bujak. 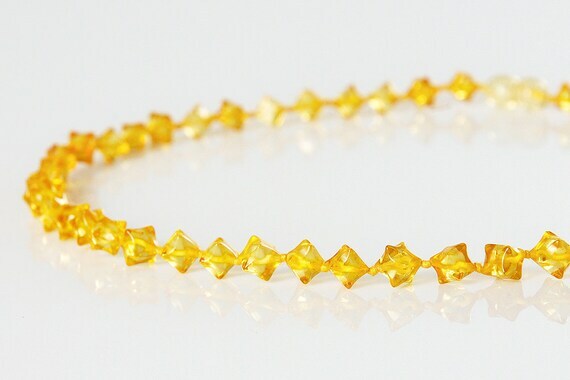 The beads are made from natural honey gold Baltic amber. I love the pretty soles on this pair of sandals from Chameleon Clogs! The red leather straps just pop. Each pair is made to order. 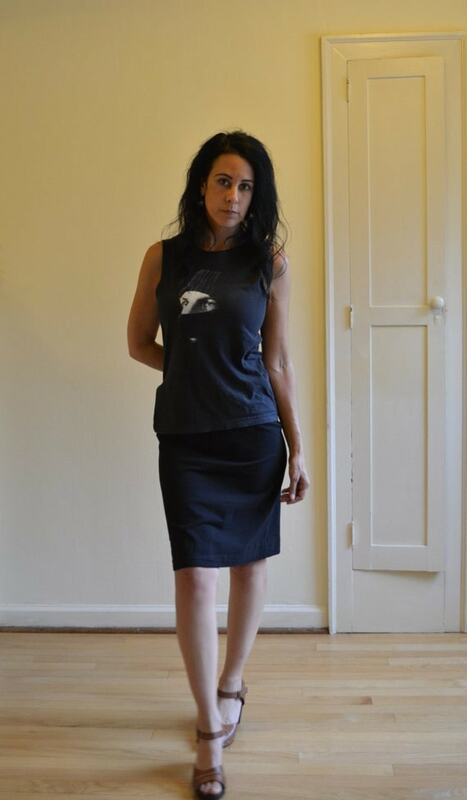 This cotton jersey skirt from Out Of Line is made to order and available in different colors. They also offer a shorter version. This neat collection of leather bracelets from Go Wild Boutique are made to order and available in four different sizes. They are painted and finished with eco-friendly paints. I will close with this gorgeous handmade corset from Taylor Lane Designs. The flowers have been embroidered onto the linen fabric in house. It is made to order.